Not cricket apparel or cool clothes, but flowers: free gifts that appear each summer to brighten my days and my by-then mostly green garden. They all receive my admiration but none of them need or receive any attention in between. 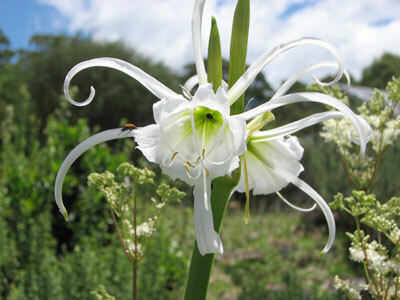 The Spider Lilies are extraordinary, delicate space age creatures that prance and arabesque from fleshy bulbs and leaves. Beside them flower the herbs yarrow and meadowsweet; the nearby oregano is about to burst into white flower spikes too. 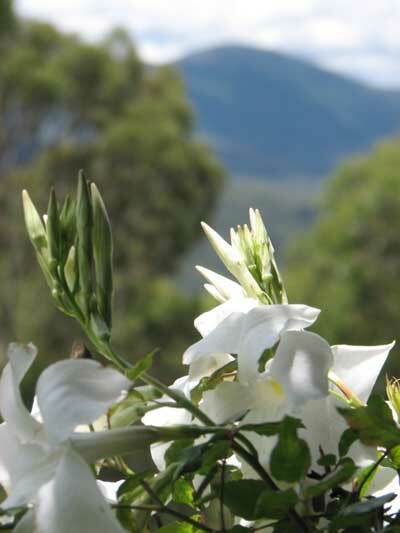 Twining daintily along my verandah and perfuming my evenings is the Mandevilla laxa, commonly called Chilean Jasmine, although it isn’t a jasmine at all. 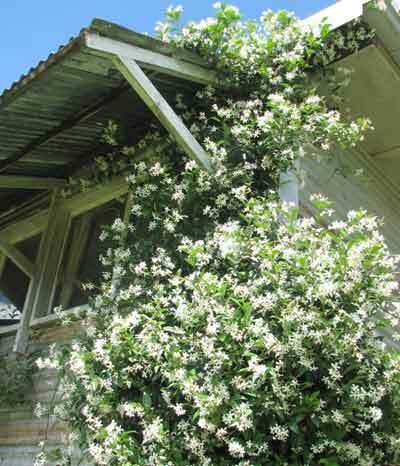 And the shed is being overwhelmed by a rioting fountain of Chinese Star Jasmine. The scent of these flowers comes to me separately and together at different spots in the garden.